The former Children's Energy Center - the property is now up for sale for the third time. PHOTO: Patty Jones. OCEAN BEACH, CA. 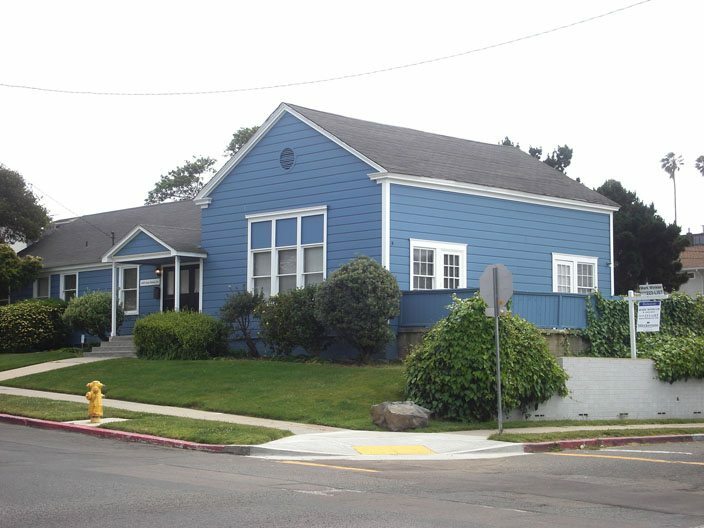 Anyone who has lived in Ocean Beach for any length of time remembers the old Children’s Energy Center, a sprawling blue single-story building with a large playground in the backyard. Raised off the street level a bit along Ebers, it sits directly across from the OB Child Care Center and OB Elementary playing fields. It was usually full of kids, for after all, it was a child care center itself, serving kids from 2 to 10 years of age. For years. Well, the kids were all kicked out three years ago – and it appears all for greed. For ever since, the property and building have remained vacant. The place changed owners and the new owner thought he could make a quick buck or two. So he closed the Center, made some improvements, and put it up for sale. … Well, It never sold. This is the sad and shameful story of how greed overcame good common sense, turned out the children and closed a center that has functioned as a needed community resource for 26 years, all to end in stupidity. The former Children’s Energy Center, at 4689 Santa Monica Avenue, is back up for sale – this time for the third time. The property is currently up for sale at $1,275,000 (just re-listed in early March). It was listed for six months ending in late February for $1,395,000, but there were no takers at that price. Before that it was listed from January of ’07 through February ’08, first at $1,890,000 and eventually reduced by the time it went off market to $1,590,000, again with no interested parties. Thomas M. Funke was the previous owner. And he had it for years. Technically, he bought the place on 10/14/04 for $550,000 from another corporation, “Del Monte Condominiums LLC.” He had to be involved in that company. But a couple months after it went into Funke’s name he recorded a grant deed to C N D (1/3/05), and a few months later it was grant deeded again, to Santa Monica Avenue LLC, who holds title at present. The actual current human owner is Mark Winkler, the well-known Peninsula realtor. Winkler is the one who threw the kids out and thought he could make a killing. As a realtor he had his hand on the pulse of Point Loma and Ocean Beach, looking for good deals he could flip. Making money, that’s his game. Kicking the kids out for a buck, that’s his shame. Winkler has plans. The ‘for sale’ sign comes with the plan to tear down the center and build four new 2200sf houses, that supposedly come with permits (advertised as being validated by the Coastal Commission through August of this year) to split the property into four 3500sf lots where the houses would be built. Such huge condos are uncharacteristic for this area of Ocean Beach. But the OB Planning Board apparently approved it a few years ago. People spoke against it when it did come before the Board. There was a lot of angst in the community the day the Children’s Energy Center was forced to close. Larry Himmel did a piece on it. Pat James was there with his camera. Chris Yule, the Center’s former director remembers that day all too well. It was on Cinco de Mayo, she told me, May 5th, 2006. She had been the Center’s director since 1980. 1980 – for 26 years. I spoke to Chris by phone – she still lives in the area. Chris is fairly embittered against the old owner, Thomas Funke, and Mark Winkler – the new owner, as well. Without her knowledge or any notice by him, Funke sold the place to Winkler. She found out, of course, and even gave Winkler the grand tour, with him praising her for all the good work she was doing. Within months, the place was closed and she was dismissed. The old owner, Yule said, would not spend any money to fix the place up. It did not close because it was not up to code, she told me emphatically. And Funke had money, she assured me. He had properties in downtown San Diego, in Iowa, in Michigan. Enrollment was falling, she said, because Funke was so stingy. Her last raise was in 1995. When the place closed, Funke left her without a pension, without a severance pay, … he left her with nothing. Sadness was in her voice. At its peak the Center had 67 children and 9 staff besides her, Yule recounted, her spirits obviously lifting. It was truly a community resource. OB loved the place. OB Elementary referred kids to her all the time. The Center was a proud part of the Ocean Beach neighborhood, they were in the Holiday Parade every year – they did the boogey board drill team. Her fees were very reasonable. The place was recognized as a great school. She had kids, Chris said, who when they grew up, brought their kids to her. She had all kinds of families that were getting child care assistance, from the GAIN program, from the YMCA. “We had kids from Santee, with parents who used to live in OB, would drive their kids to OB everyday from Santee.” At the time of its closure, the Center had 35 to 40 kids. When it when before the Planning Board, Chris said, parents and neighbors showed up to oppose Winkler’s plans. “This was the destruction of an institution,” she said. Before the Children’s Energy Center, Funke had bought the property from Margarate Franklin in the late 1970s. Before she sold it, Franklin had it as the Playhouse Nursery School. So, the site has been a long, historical part of the area of Ocean Beach dedicated to the community’s children. Bottom line – a real estate speculator bought the place, obtained Coastal Comish plans for big condos, and thought he could DOUBLE his investment without really building anything. Greed replaced a sense of community duty and history. Usually greed, as a screed, is well rewarded. Especially during the days – oh, those golden days – of the giant real estate bubble. But here greed has been replaced by stupidity, and sadness, and shame. And with a community loss. pimpshackdave assisted me in this article. It is worth emphasizing the information that Chris Yule worked for 26 years as the facilities director, doing something important and beneficial to the community and unsupported in the most basic sense- no pay raise since 1995, no pension, no severance pay. This is yet another example of the scorched earth left behind in our communities by institutionalized greed. At this point, you’d have a hard time convincing me that Mr. Funke is capable of feeling shame. Looks like good old laid back OB now has it’s share of greedy people who could care less about the kids. Shame the planning bunch would let this bum build four condos, but these are greedy times. Nice piece. But where are Winkler’s comments? Ah, new article, new name…nice piece, Frank! One question, since you were the one talking to Chris – did they really make building improvements AFTER kicking out their tenant and knowing full well they were planning to demolish the building and build a bunch of million-plus mini-mansions? Why? I attended the Children’s Energy Center from 1989 – 1991 and my daughter attended from 1999 – 2002. I can tell you that there were little to no improvements made to the Center between the time I attended and the time my daughter did. There was peeling paint, constant plumbing issues, and even the concrete slab on the back porch cracked in half making that area a hazard. The owner of the property never put any money into improvements or repairs. I also can’t speak to the why but I can verify that improvements were made after the Children’s Energy Center was shuttered. The new owner fixed it up, appeared to live in it for a short amount of time and showed it often with open houses and night time parties. Seems to me like that could be considered a historical building and therefore able to be legally saved from the wrecking ball. OB Historical Society meets at 7 pm this Thursday night at 1984 Sunset Cliffs Blvd. Maybe they could suggest something. A similar situation over on the 4800 block of W. Point Loma Bouldevard in North OB. Two very old (but occupied) houses are being sold with permits and plans for condos. I’ve heard that some of the advertising neglects to mention the houses. It make me wonder how properties are for sale in OB with pre approved condo plans. I would also like to know if there is anything “cookie cutter” about the condos, like how many are tall and skinny three story structures with party decks on the 2nd floor? Perhaps the same architect or developer? Maybe a pattern will develop with time. By then it might be too late. Ms. Yule is far to modest. My family has known Chris for years, she is my closest friend. She begged both Funke and Winkler to keep the school open. At the time of its closing, less than $3,000.00 in repairs would have kept the school open. The school was refurbished long AFTER its closure. My guess is Winkler needed to cover that mortgage any way possible. Why no comments from Winkler? Too many rocks to look under! As for Chris? Her story is a down right shame. Funke pulled every last dime out of that school for himself and his future real estate endeavors. He left Chris with nothing, no severance pay, back vacation pay, nothing. Chris is too proud to say that she is living on nothing but her deceased husbands Social Security of less than $800.00 a month. This for a woman who loved her children (never having any of her own), and loved OB and the people. She even found time to help get a new landscape sprinkler system donated to the OB Fire Department. Did any of them show up in defense of the Energy Center on its final day…nope. If there is a hell, Funke will be the usher. How is Chris doing nowadays? This whole debacle must have taken a toll on her. I remember when Funke told her he was going to leave the property to her when he died. Giving her that little bit of hope only to rip the rug right out from underneath her has got to be the lowest of the low. I think you are right about Winkler needing to cover the mortgage because he rented it out for about a year. There was a guy that lived there that did open houses and night time “viewing” parties that looks nothing like Winkler. Even though I live in the area I didn’t know the goings on of the Children’s Energy Center until it was too late. I am one of Chris’ “children” from 1989 – 1991, as is my daughter from 1999 – 2002. Older Article: Do real taxpayers think Transit riders are pond scum?